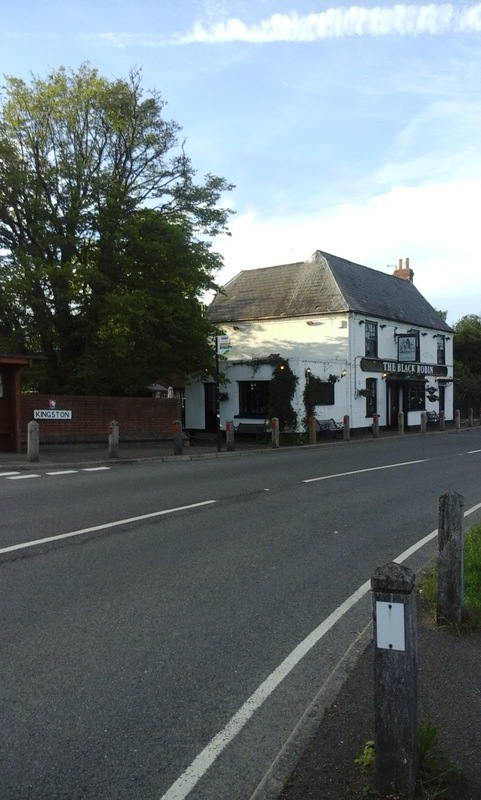 My picture shows a delightful pub nestling in the Kent countryside which I chanced upon taking the backroad from Canterbury to Dover - the Black Sheep in the tiny village of Kingston. It is as lovely inside as out, it has very pleasant and courteous staff, a charming village atmosphere, sells outstanding beer (as it should - this used to be Hop Country) and sumptuous food. I had a matchless pint of Doom Bar (true, Cornish beer rather than Kentish, but my all-time-favourite tipple and something never to be ignored when it is in attendance) and a fish pie of such utter gorgeousness that I shall never be able to face one again with the same anticipation. Bursting with the most beautifully fresh salmon, haddock and prawns as well as oodles of smoked fish and a topping of nicely chopped new potatoes, glorious cheddar cheese and a nicely runny poached egg. Mmmmmm! It was one of those interminable late May evenings which seem to hover on the brink of sunset but never quite get there. It was a peaceful Sunday, bursting with the promise of a summer, bees buzzing in the flowers, the fields of wheat ripening even as you looked at them, and one of those magical breezes which waft in through the open window and seems to cleanse the very air it passes through. I avoided the bustling bar and sat in a quiet back room where the only other patrons was a trio of ladies of mature years, one of which seemed to be a long-term local originating from America. With its typically English pub-style mix of furniture - IKEA-self assembly tables, oddments picked up in various antique shops, strangely domestic pieces and everything celebrating the once trendy fad for stripped pine - the room was hugely comfortable, there was a vast pile of logs by the open fire (which contained just a single candle to avoid it looking too empty) and all in all, I could not wish for anything better. I'd spent a lot of my early youth in this part of the world and felt utterly at home. But I doubt that I will visit the Black Sheep again. For all its visual effort to create the archetypal English pub, it destroyed it utterly with ghastly, inappropriate and offensive music from which no escape was possible. It turned my beer sour and my fish pie to ashes in my mouth. Music was not necessary - the chatter in the bar was loud enough to permeate the whole building, and those of us in the back room were clearly content with our own aural space. I enjoyed overhearing the American lady say gently to her friends, "Don't you find this music simply dreadful?". Nevertheless, despite every bit of evidence pointing to the inappropriateness of loud piped music, we were subjected to insistent whine of ersatz-Country and Western and computer-generated female-type wailing, generally in a minor key and clearly expressing sentiments of deep sorrow and personal loss. How to destroy an atmosphere utterly with one easy tap on a tablet screen. The UK is not alone in stuffing its TV schedules with programmes about food. The English seem obsessed with watching people work against the clock in sweaty kitchens to present the most weird and wonderful food on a plate to unsavoury types who utter pointless criticisms which are of no value to anyone at all. Yet, this seems to have had one benefit to society; food is now treated with a little more care and attention and diners are often more critical of stuff they don't like, even if they borrow all their critical ideas from the people they see on the television. So my fish pie was probably inspired by Masterchef, Come Dine With Me, Yes Chef, or any one of a million similarly themed reality shows. What Masterchef, Come Dine With Me, Yes Chef, and all the rest do not do is tell you that food is only a small part of it. A fine dining experience involves ALL the senses - sight, smell, taste and hearing. Yes, hearing! We eat as much with our ears as with our eyes, our noses and our tongues, and we want something which complements, not distracts, which mirrors the food, not opposes it. Country and Western goes with burgers and fries; something soothing and relaxing goes with Doom Bar and Fish Pie. When the Black Sheep learns this, I would certainly be tempted back.